AUSTIN, Texas – Sept. 20, 2018 – SoftServe, a leading digital authority and consulting company, today released the results of its market research study that examines how enterprises are responding to the digital economy. The research found that 71 percent of the respondents in the United States and the European Union are in the early stages—Reveal and Transform—of four unique states across the Enterprise Digital Journey. For an in-depth analysis and the full results, read The Enterprise Digital Journey white paper. With fierce competition in today’s global landscape, leveraging cutting-edge technology and deploying new business models is not a one-off pursuit, but rather a continuous process of iteration and refinement. Companies should stop referring to Digital Transformation and instead plan for a continuous Digital Journey. SoftServe’s commissioned market research polled more than 700 decision makers across Financial Services, Healthcare, Media, Retail, and Software companies to determine how brands are adapting to the digital economy, the specific business needs that are driving change or disruption, and the technologies that are critical for the future. 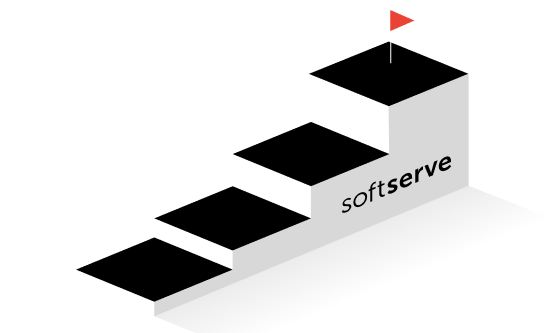 SoftServe’s innovative approach – The Enterprise Digital Journey – provides a more comprehensive view focusing on the constant iteration and refinement of solutions that will help companies to remain competitive in today’s increasingly digital world. Reveal – Clients are unsure where to begin or how to compete and are looking for assistance in (re)identifying their market position. Transform – Clients have a point of view on where to begin and need assistance from this point forward. Accelerate – Digitally mature clients are confident in their direction and need expertise in delivering prescribed solutions. Optimize – Advanced clients with one or multiple digital solutions that need assistance calibrating or future-proofing recently launched applications or architectures to reidentify differentiation in the market. Financial Services respondents indicated 36 percent are seeking insight into what to create and where to win in the market (Reveal), while 42 percent currently have a point of view on where to begin (Transform). Healthcare respondents indicated 29 percent are in the Reveal stage and 43 percent are in the Transform stage, with a noticeably higher response rate – 17 percent – for the Optimize stage suggesting systems need to be continuously improved. Media respondents indicated 49 percent have a point of view on where to go next (Transform), which signals the sector is more mature with a defined roadmap for the future. Retail respondents indicated 32 percent are in the Reveal stage, while 37 percent are in the Transform stage. Software respondents indicated 38 percent are in the Reveal stage, 31 percent are in the Transform stage, and a noticeably higher response rate – 24 percent – for the Optimize stage suggests an acknowledgement of the effort to deliver digital; however, require the most assistance – out of any industry – to optimize existing platforms and solutions. Respondents were also asked to rank the most important cutting-edge technologies. Predictably, cybersecurity, big data processing and analytics, and cloud computing came in as the top three across all decision makers. Hybrid clouds were deemed an essential cloud computing technology by 50 percent of respondents. The top three industries that view hybrid clouds as essential are Retail (61 percent), Media (56 percent) and Software (54 percent). To learn more about the survey results and SoftServe’s Enterprise Digital Journey, please read the white paper .